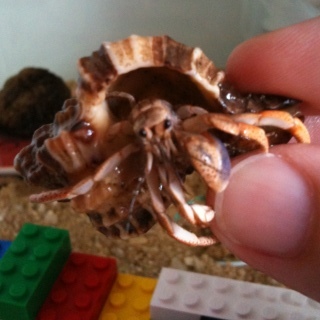 Please welcome the newest addition to our family, a hermit crab named “Peekaboo”. He comes from Wings at Atlantic Beach. He lives in a plastic shoe box with a sandy floor, a water dish to bathe in, and LEGO’s to crawl on. He likes to be sprayed with water, and he likes to crawl up Audrey’s arm.